What is the wall tile? - Where can I find this tile? I love the color/shape. Ok thanks. I wasn't sure if it was from the same company as the floor tile. Where can I buy the wall tile? - LOVE the wall tile. Have googled Ann Sacks and Heath and Heath @ Ann Sacks to no avail. HELP!! Would love to order this tile online! What color is the tile? tub - what is the brand/or who is the manufacturer of the tub? anyone have any experience with this tub? A difficult wall made simple...love the accent wall in a basic 3" x 6 but vibrant in color., Casa Blanca Tile (Harrison NY) can provide tiles in a wide range of colors to duplicate this look. I love the size of the hex floor tile. What size is it? I love the flooring as well! Are they porcelain? Glazed vs. unglazed? Window casing? - I like the simplicity of this window casing without just being flat stock. Can you tell me how you achieved this look, is it a single piece or multiple pieces? that looks to be mitered at each corner. go to the lumber store and find a profile you like thats not flat. It could be MDF in which case it's probably mitred from a single piece of stock. However if it's 2 pieces, the 2nd piece you're looking for looks to me to be "Bullnosing" which is wrapped around outer edge. Floor tile - I like how the floor tile is "flatter" than the typical white octagon I see. Gives it an upscale look. Can you tell me the brand of the tile? Thanks! The floor tile is by American Olean -Unglazed Ceramic Mosaics, 2” x 2” hexagon mosaic, Color: A25 Ice White, matte finish, 1/8” grout width. What is the yellow tile used on the wall? Thank you for your question. The lowest point of the wall is approximately 4 feet tall. the highest point is 9 feet tall. You want to have more than half of the space above the tub at 6 plus feet. Good luck with your renovation. 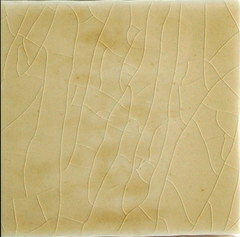 This looks like a 3x6 classic field tile, possibly in our glaze G24.2 Mango. You can order glaze samples here! What's the brand of this tube? - What's the brand of this tube and where can I find one like it? Feel free to browse through the rest of our collection as well! Where can I get the tub? - Where can I get the tub? Love the tub filler/ handheld! Who's is it? What is the brand of yellow grout in the floor tile? 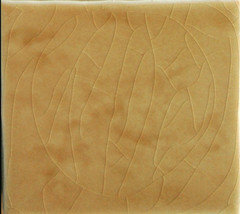 - Yellow grout seems to be unavailable in most national brands of grout. so duplicating the look of this floor has been next to impossible. I would really like to know what brand this yellow grout is so that I can use it. Hello, Thank you for your question. I would recommend Durabond grout in either sundance or buckskin. Thank you for asking about the tile. This is a 3x6 tile. Look for similar options from Heath at Ann Sacks to find the variations in color. 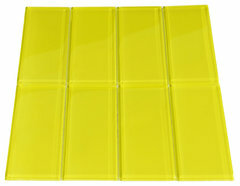 Bathroom tile - Where did you get the yellow tiles featured here? Where can I get this tile from Toronto Canada? Pick TwoFor those who are not fully onboard with a bright and bold-colored bathroom, here's an example of a colorful yet more restrained palette. Placing two very deep, vibrant colors — teal green and golden yellow — against a backdrop of soft white gives the space a cozy and inviting feel. 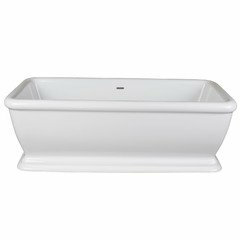 Because pedestal tubs appear to float in their surroundings, they can be a wise choice for compact bathrooms. Not only do they take up less visual space, but their smaller footprint also exposes more flooring. 8. Bright white subway tiles will keep your small space looking fresh. But don’t be afraid of having a little fun up here. Clad a wall in brightly hued tiles, as in this sunny retreat, and you’ll never want to leave. 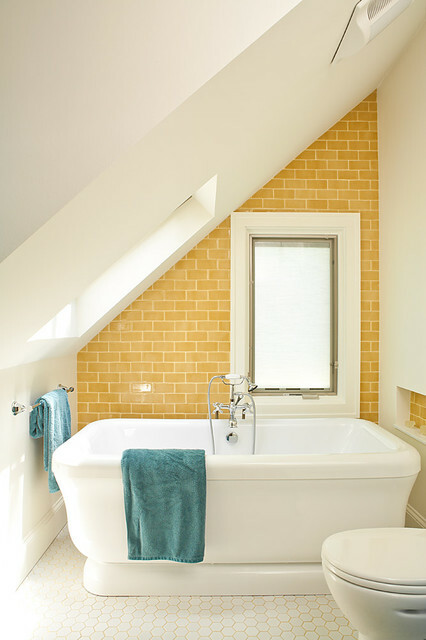 To warm your bathroom up a little, choose yellow as the dominant color through tiles or paint and accent with blue. Given its sunny disposition, this combo is great if you live by the water.Do: Think about using traditional blue mosaic tiles, which don’t ever seem to grow stale.Don’t: Overdo it with the yellow because it can become overbearing, particularly in a small room. Things to consider: Cracked tiles can be caused by a variety of problems, ranging from something heavy dropped on the floor to a subfloor issue. The unfortunate result is an unsightly broken tile marring the look of your floor or, in some cases, your backsplash or wall. Fortunately, replacing a broken tile is fairly simple if everything goes as planned. One contractor said he’d seen clients try to glue broken tiles back together. But this isn’t ideal, since you’ll probably always be able to see the fault lines.Instead, you can use a cold steel chisel to chip out the tile. This is delicate work that requires applying the right amount of pressure. Some people find it helpful to break the tile before they chip it out. “Most of our guys break the tiles so they don’t damage the rest around it,” says Joe Smith, general contractor at Owings Brothers Contracting in Eldersburg, Maryland. If you’re removing a tile from a shower wall, it’s going to be difficult to dig the tile out without damaging adjacent tiles if the grout is still in place, notes Robert Jenkins, remodeling contractor at Bobmahalo in Wahiawa, Hawaii. “Dig the grout out if it’s not cracked out already,” he says. You want to scrape out all the thinset or mortar down to the substrate. MMM. not yellow though. Love white against a bright though.